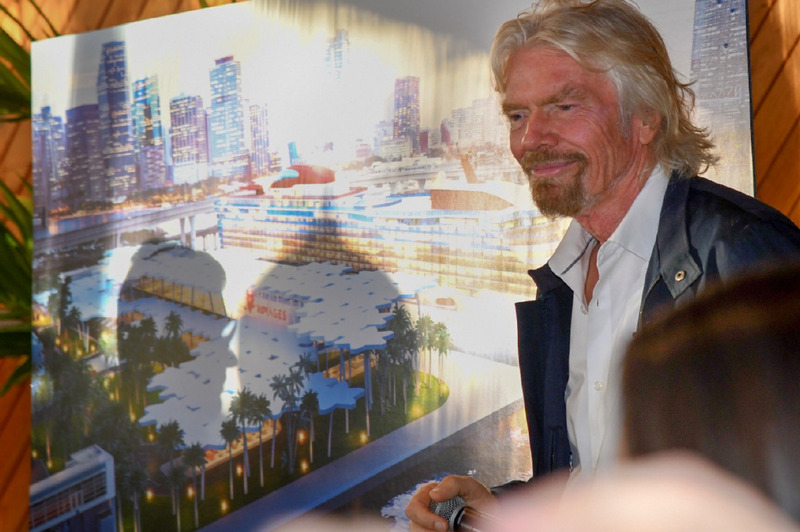 Sir Richard Branson’s new cruise line is working with Miami-Dade County to build a new lush tropical terminal overlooking the Miami skyline. Virgin Voyages 2nd ship will sail from Miami during fall/winter season of 2021/22. Inaugural season sailings to open for bookings on February 14. Virgin Voyages calling for ocean conservation with sponsorship of Sir Richard Branson’s Blue Hole Expedition. MIAMI, Fla. — November 28, 2018 — Virgin Group Founder Sir Richard Branson and Virgin Voyages President and CEO Tom McAlpin were joined this morning by Miami-Dade County Mayor Carlos A. Gimenez, Chairwoman of the Miami-Dade County Economic Development and Tourism Committee Rebeca Sosa and other local government officials to announce plans to build a new cruise terminal for Virgin Voyages. 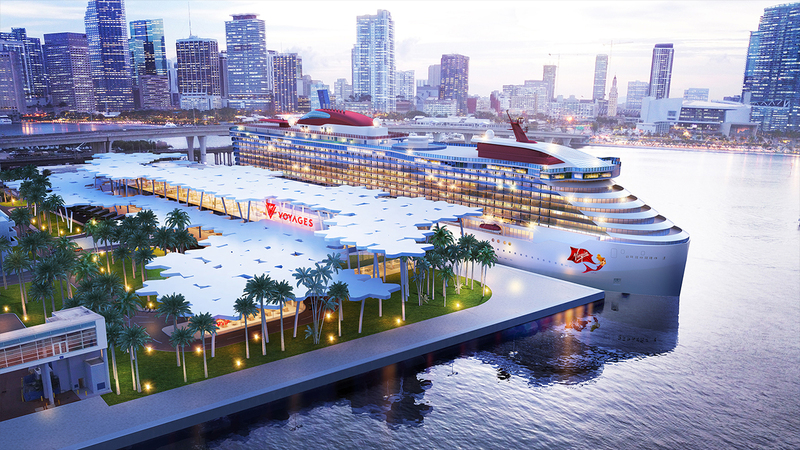 With this new terminal and a long-term commitment to PortMiami, Virgin Voyages also announced that its first ship, the Scarlet Lady, will continue to sail to the Caribbean from Miami throughout 2021. The company’s second ship will sail from Miami during the fall/winter cruise season of 2021/22. Furthering Virgin Voyages commitment to South Florida, the locally-based company will hire nearly 100 customer service positions to support its opening for bookings, which Sir Richard Branson proudly announced will be February 14 for the general public and February 5 for those currently holding pre-sale deposits. “South Florida is our home and with our fleet now growing to four ships, we’re humbled and thankful to soon have a gorgeous new terminal overlooking the Miami skyline, an incredible view that will set the stage for the alluring journey that we will take our sailors on,” said McAlpin. 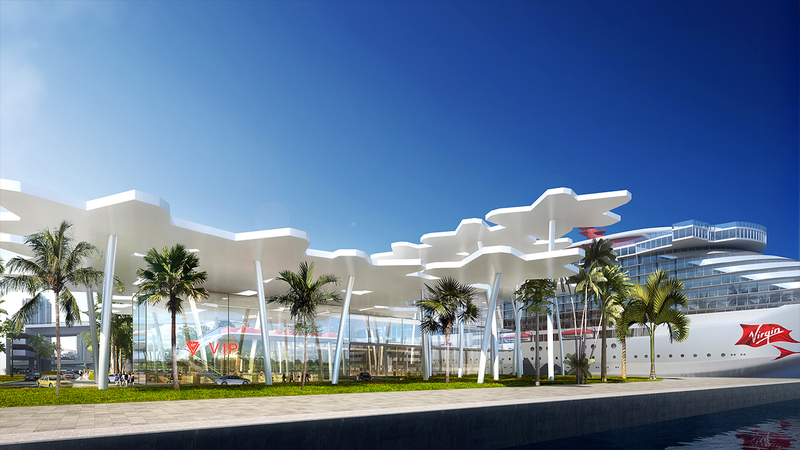 The Virgin Voyages Terminal will be located on the northwest side of the port. Pending the Board of County Commission’s approval of the MOU for construction of a new cruise facility; along with the subsequent berthing agreement, this project will start next year and is slated for completion by November 2021, the beginning of the year’s cruise season. This new terminal will have a significant positive economic impact to the entire region and solidifies an important homeport for Virgin Voyages as the company continues to grow. The palm grove design is inspired by Miami Beach’s iconic palm trees and the island’s historical origins as an area intended for harvesting coconuts. The terminal’s rooftop is designed to resemble a palm tree grove with rooftop pockets that allow natural light to flow into the building by day, and uplighting by night that will light up the company’s iconic Virgin Voyages red logo and allow the facility to shine bright, mirroring the city’s skyline. The two-story storm-proof glass facility will be replete with lush landscaping giving the terminal a plaza-like feel with designated areas for drop offs of VIP’s, ride-sharing and provisioning, designed to provide a seamless shore to ship experience. Virgin Voyages is committed to creating an epic sea change for all by playing a significant part in securing a healthy future for the ocean and having a positive impact on the communities and ports it visits. Working hand-in-hand with Ocean Unite and Sir Richard Branson, Virgin Voyages is sponsoring Sir Richard Branson and Fabien Cousteau’s Aquatica submarine dive to Belize’s Blue Hole, part of a UNESCO World Heritage site, on December 2. Virgin Voyages intends to support ocean research and conservation projects like the Blue Hole Expedition in an effort to raise awareness and gain insight into the issues facing the ocean today, the company aims for these efforts to help guide them to making better business decisions for its ocean and port communities. With its inaugural season scheduled for 2020, Virgin Voyages’ first ship the Scarlet Lady was designed to reflect a yacht’s sleek luxury. Featuring spaces designed by some of the top names in contemporary interiors, the Scarlet Lady will be Adult-by-Design, a sanctuary at sea for the 18+ traveler. A dose of ‘Vitamin Sea’ will be naturally intertwined across the entire ship, with well-being activated through a mix of high-energy moments coupled with relaxation and rejuvenation. The Scarlet Lady will also feature alluring entertainment and 20+ world-class intimate eateries onboard. Putting a twist on luxury, which the company refers to as Rebellious Luxe, Virgin Voyages will offer incredible value for its sailors with all restaurants, group fitness classes, soft drinks, and many more Virgin surprises included within the voyage fare. The Scarlet Lady, will sail from Miami to the Caribbean in 2020, hosting more than 2,770 sailors and 1,160 amazing crew from around the world. Keep watch on virginvoyages.com for more updates.